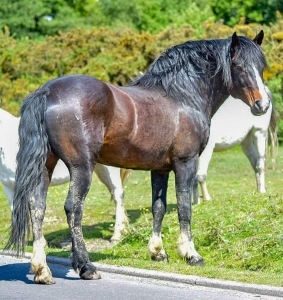 Anybody who visits the New Forest will be familiar with the sight of thousands of ponies of all shapes and sizes grazing the area’s expansive lawns. During late spring this view changes, with a small band of impressive stallions joining the thousands of mares that call the Forest home. But the route to becoming a free roaming New Forest stallion is not a simple one. Since 2010 the New Forest Higher Level Stewardship Scheme has provided funding for grazing for up to 30 stallions each year. This is a partnership between The Verderers of the New Forest, Forestry Commission and New Forest National Park Authority. This funding encourages commoners to own stallions and ensures they have land to graze on during the long period when they are not permitted to be on the Forest. From this pool of 30 a number are released each year. All stallions have to be inspected and licenced by the New Forest Pony Breeders & Cattle Society. Commoners can then choose to put their stallions up for inspection by judges from the Verderers and if accepted can then join the stallions scheme. This year 15 stallions have been selected to ‘run out’ in the New Forest until 26 June. Numbers are kept low to ensure the number of foals born each year is sustainable and they are specially chosen to improve the quality of the foals produced. Find out about all 15, including pictures of them and where they roam. This scheme keeps the quality of New Forest ponies high, supporting the ancient tradition of commoning in the Forest. Commoners own the free roaming ponies and cattle whose grazing shapes precious habitats for a myriad of species and gives its landscape its distinctive look. When stallions are out on the Forest the pony population can be more unpredictable than usual. So please take extra care when driving and never touch or feed either stallions or mares.